I’m not sure why, but I’m in the mood to spread some blog love this morning. Perhaps it’s because I have been reading other people’s blogs to distract me from the arduous work of writing my own. I’m three martinis down, I have a story marinating in my brain – it should be prime writing time, but whenever I stare at that blank page on the computer screen, I give up in disgust and then search around for something else to read. Anyway, my old friend Lance Mannion is in the middle of a series of posts about his visit to Occupy Wall Street and the dangerous revolutionaries poets and ironworkers and clergy he met there. My favorite of the signs I saw yesterday wasn’t a protest, it was a joyful boast: Proud Union Mama. My least favorite said: Even God Hates Wall Street. God, if He, She, or It exists, not having the time, He, She, or It doesn’t take sides like that. Besides, God hating anyone’s particular enemies? That’s how they think. But we know how Jesus felt about the moneychangers, and storing up treasure on earth, and rich people and needles’ eyes, and the poor and the downtrodden. We know what he said to the rich young man who wanted to know what he had to do to be saved and he’d say the same to any young hedge fund manager who asked that question today. We know the kind of company he preferred to keep. All the apostles except Matthew, the tax collector, and the other guy, the politician, were working men. If Jesus came today and said to them, Follow me, he’d be talking to Union men and women. or providing a very lengthy but fascinating analysis of mass murderer Anders Behring Breivik’s anti-muslim screed 2083: A European Declaration of Independence. Over at Juanita Jean’s The World’s Most Dangerous Beauty Salon, Inc., Ms Juanita Jean (widowed), via her amanuensis Susan DuQuesnay Bankston, dispenses a fine mix of well crafted disdain and one liners that can make vodka come out your nose. Ladies, I salute you. And then there’s that goofy looking son of a motherless goat Phil Gramm, who could not buy a date at the chicken ranch with a chicken under each arm and a $20 bill taped to his forehead. While I’m scattering links, I might as well get in a plug for the paper folding works of Dinh Truong Giang. Simply stunning. Finally, that sweet AsiangrrlMN is in love, and it’s quite adorable. Maybe it’s time to go and stare at cake recipes for a while. Then it will be time for lunch and a nap. Anything to avoid the horror of actually writing something myself. 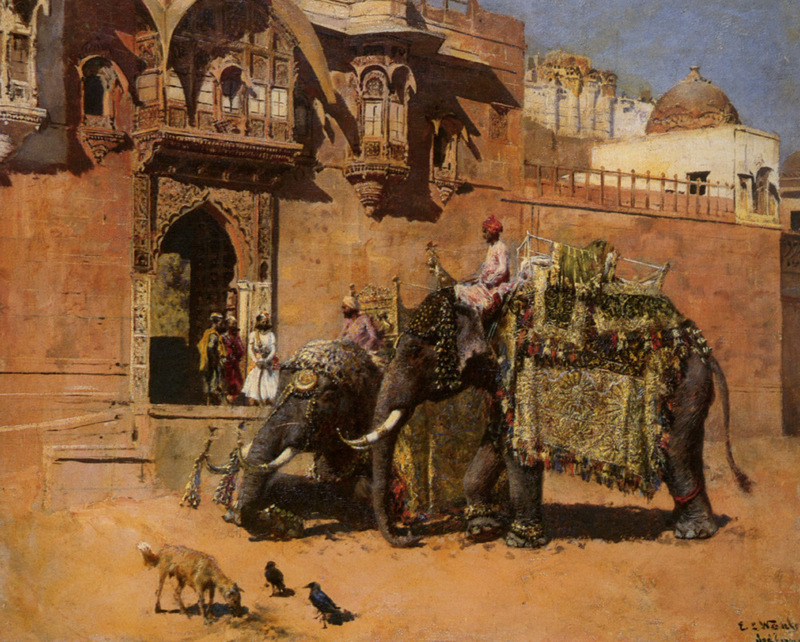 Levenson-like Pretentious Art Douche stuff: Edwin Lord Weeks (1849-1903) – Elephants at the Palace of Jodhpore via Art Renewal Centre.